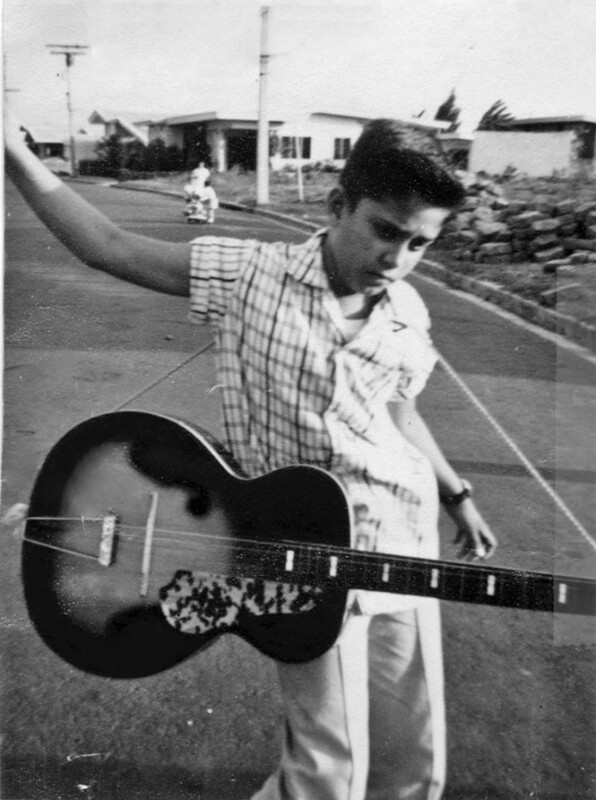 As many of you have read from my previous posts, I spent my formative years in Manila. Often times after school let out at 12:30pm (I went to the American School in Pasay), I would have lunch then take the jeepney on Taft Ave. heading north towards town. The route would take me by Vito Cruz, La Salle and onwards past the Brown Derby (delicious hot dogs), Philippine Normal University, the City Hall then towards the Post Office, go over the MacArthur Bridge (previously called Santa Cruz Bridge), into Plaza Goiti, make a little jog to the right and voila ! I found myself on one of the most interesting streets in Manila… Rizal Avenue. This was one of two of my favorite roads, the other being the Escolta. 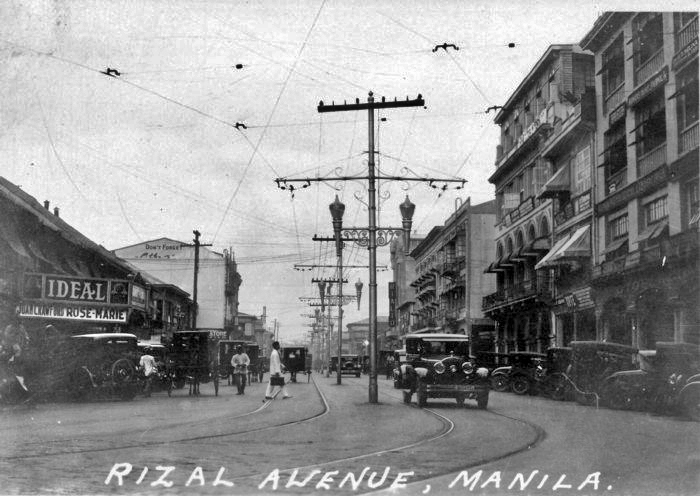 Rizal Avenue or Avenida Rizal had everything you’d need. 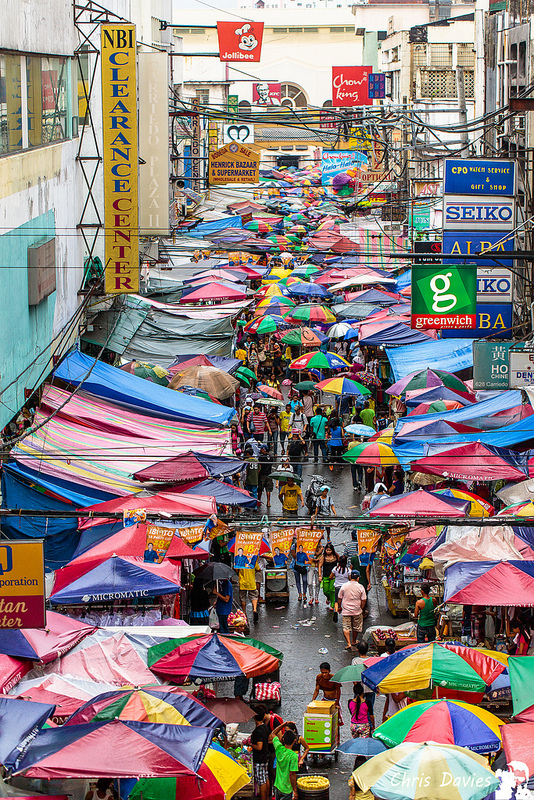 Shops galore, at least a half dozen movie theaters, side streets that beckoned, tempting you with more shopping and access to other intriguing districts like Quiapo. 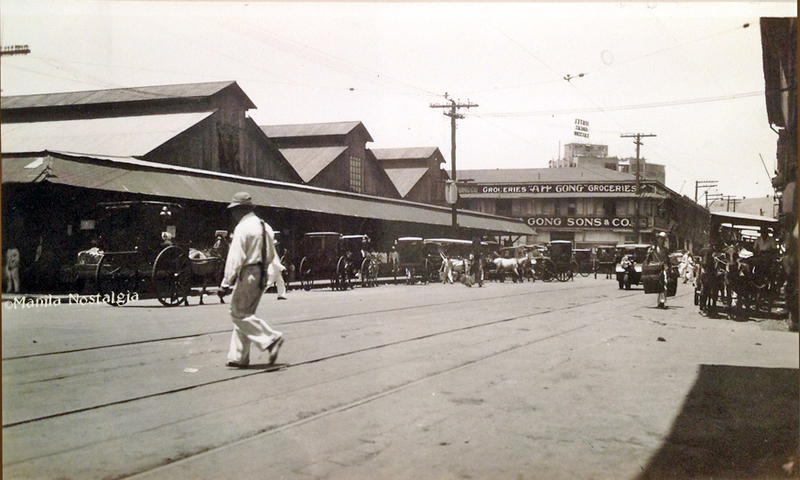 Rather than a historical thesis, I offer a pictorial essay of this rather wonderful avenue that has played an important part of Manila’s history. 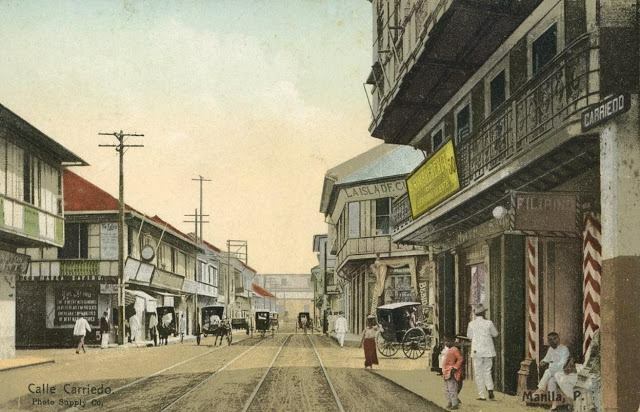 It started out being built in 1911 by combining two streets, Calle Dulumbayan (meaning the “edge of town”) and Calle Salcedo. 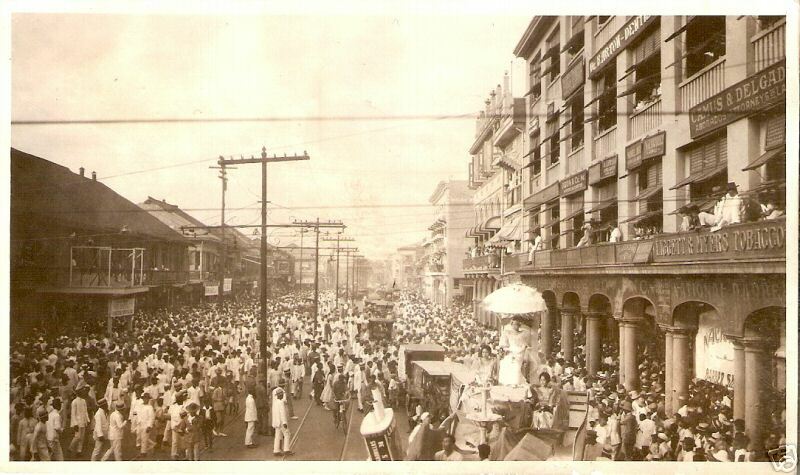 It grew to be the longest street in Manila prior to the EDSA being built. Back then it stretched from Carriedo past Bambang street (where I was born in 1945) and San Lazaro Race Park through to Grace Park, Caloocan. It is now part of the Pan-Philippine Highway. 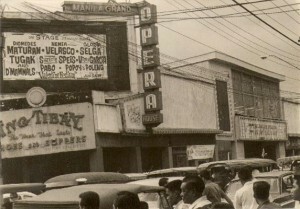 The historic Manila Grand Opera was located on Avenida Rizal. 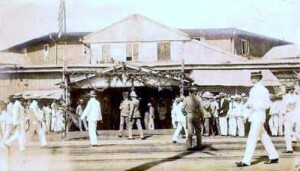 It was where the First Philippine Assembly was inaugurated on Oct. 16, 1907. A hotel with the same name now stands at the original site. For a time the avenue was blocked off by the La Campana, Salon de Refrescos. The Kneedler Building is on the right. 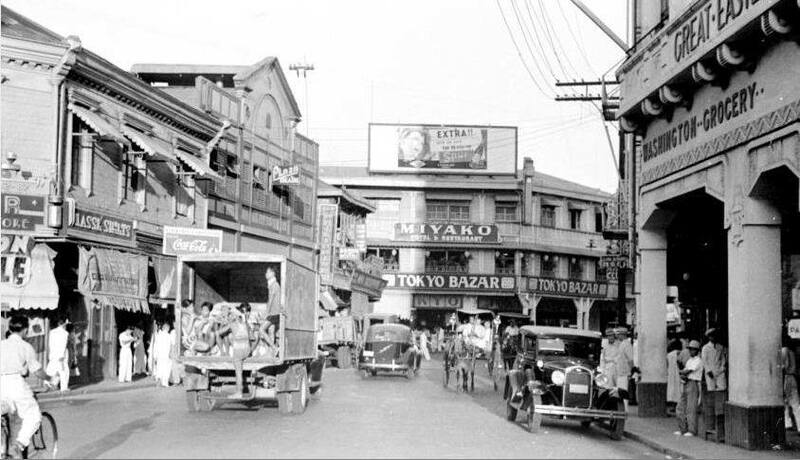 If the Escolta was considered to be the Rodeo Drive of Manila with its elite stores, Avenida Rizal catered to the masses with shops such as Bata, Otis Department Store, Good Earth. Across the Ideal Theater was the Kneedler Building, a property of Dr. Harry Kneedler, a retired physician who came with the American troops in 1900, retired and became successful in real estate. Below, the New Plaza Hotel which used to be the old Hotel de France owned by the Barrettos and where the famed Robert Dollar of Dollar Ships, the largest shipping line in the prewar era, used to stay on his visits. 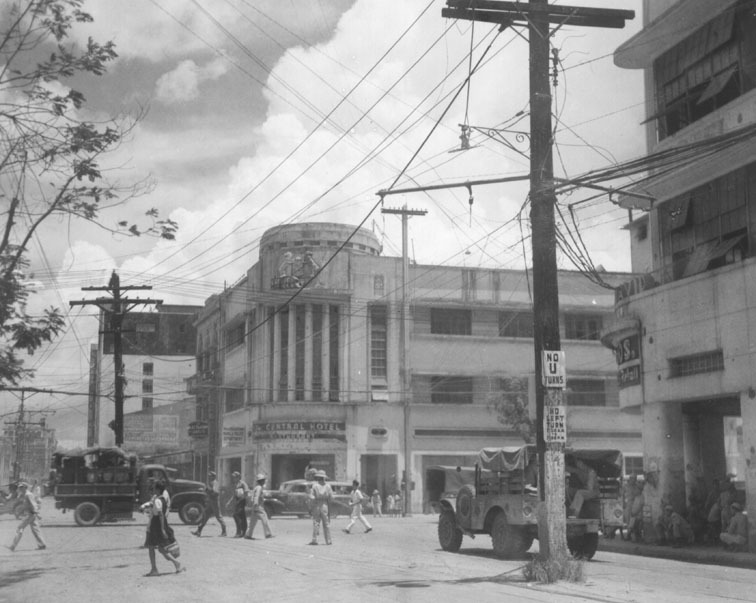 Plaza Goiti and Avenida Rizal-Nov 1941 looking peaceful just a few weeks before the Japanese attack. The Japanese occupied the Philippines for only three years, but its impact was sudden and affected Manileños even to this day. 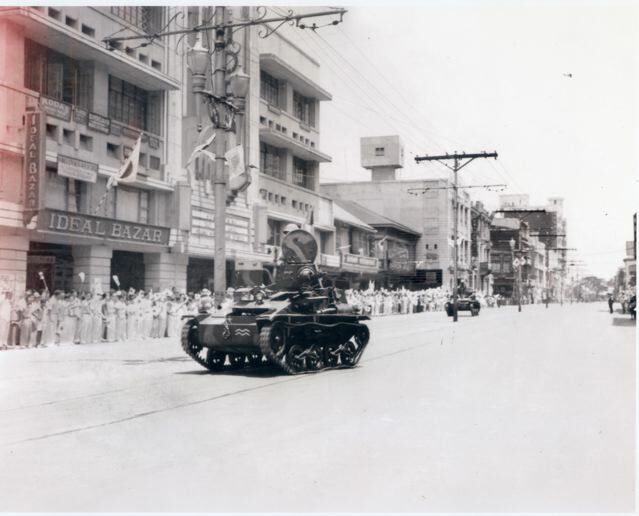 The Japanese Army loved to show their might marching their troops and parading their tanks on Manila’s main street. 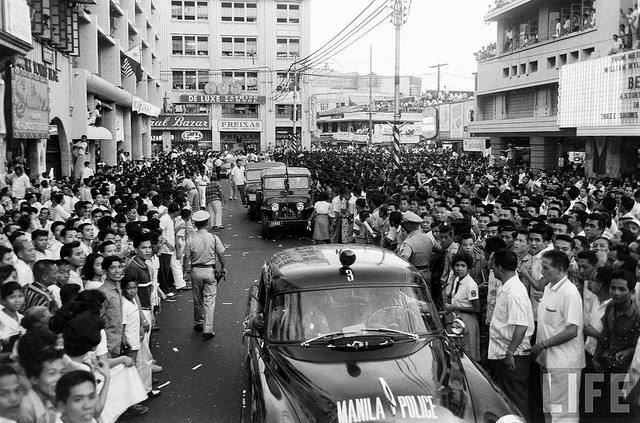 They requested the Japanese civilians and even Filipinos to stand and wave paper flags with the red sun as a show of support. 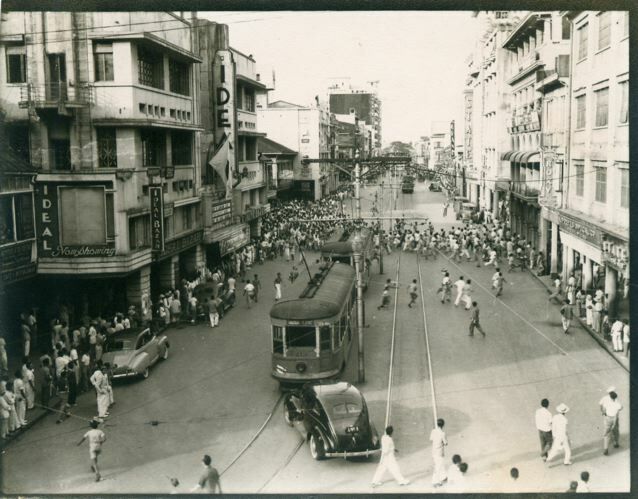 Crowds rush onto crowded tranvias as they run down Rizal Ave. during the Japanese occupation. The liberation of Manila left the city in virtual ruins. Restoration would take years and billions of pesos. 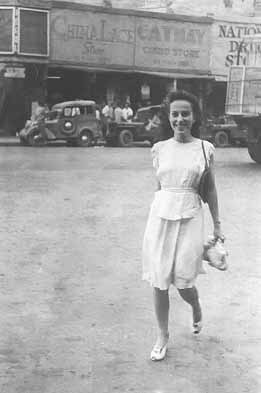 Coincidentally, I found this photo of my mother, Carlota walking through the Plaza Goiti-Carriedo intersection and a U.S. Signal corps shot of the same location. I’m guessing it could have been taken by the same photographer on the same day. The war weary GIs needed relaxation and entertainment. 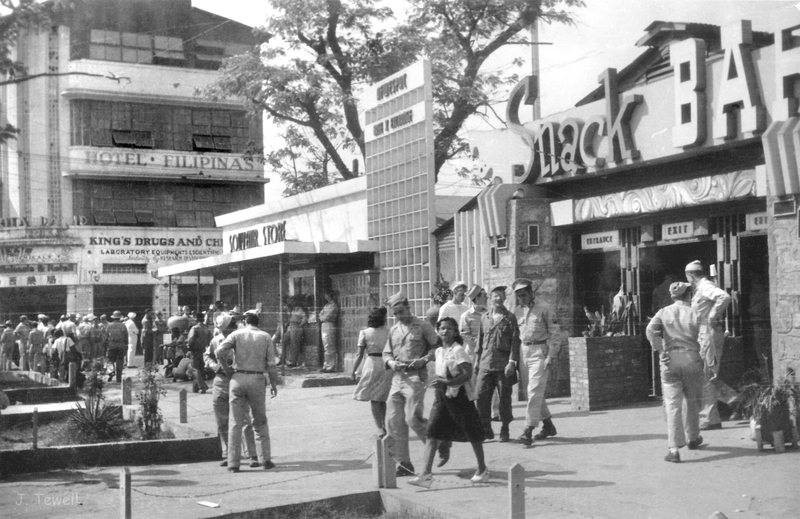 There were several USO and canteens set up throughout the city. This was at Rizal and Azcarraga. 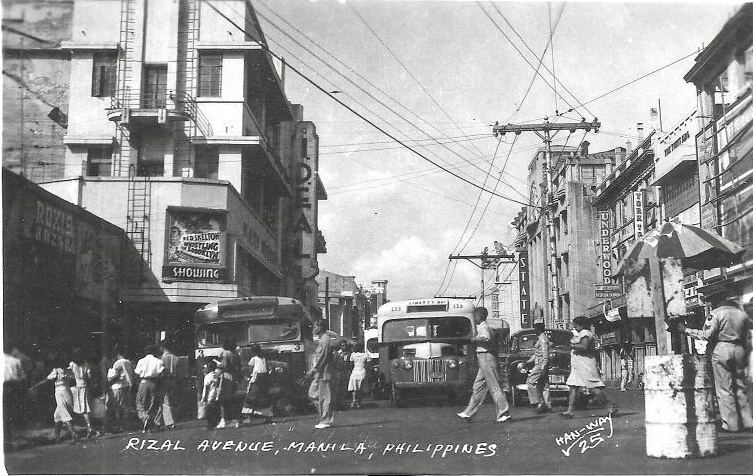 Remembering Avenida Rizal in the Fifties, I recall the movie theaters which I used to enjoy many afternoons (when did I ever study ?) like the Ideal, the State, Avenue, Dalisay for Filipino movies and the unique Cinerama at the corner of Azcarraga. State Theater taken in 1940. 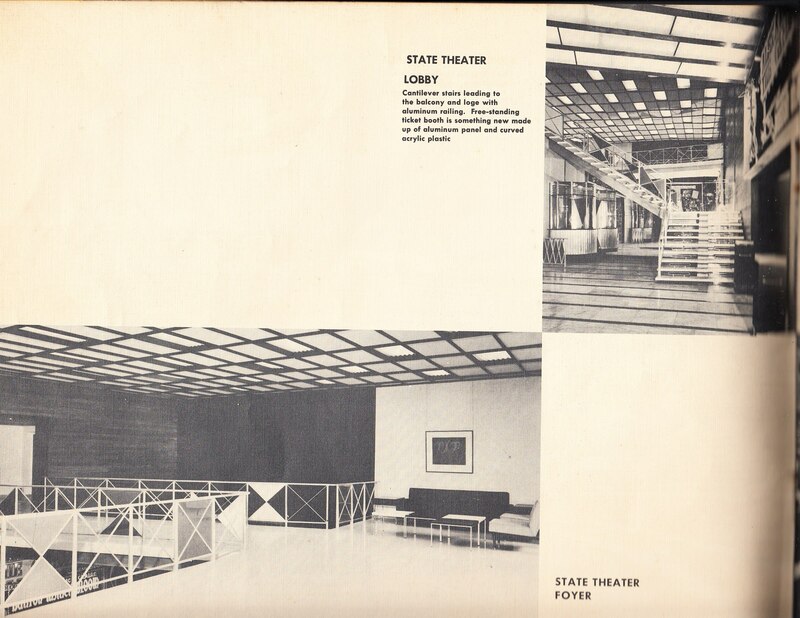 The newly rebuilt State Theater took on that 1950s modern look that we now look back fondly and remember as “retro”. 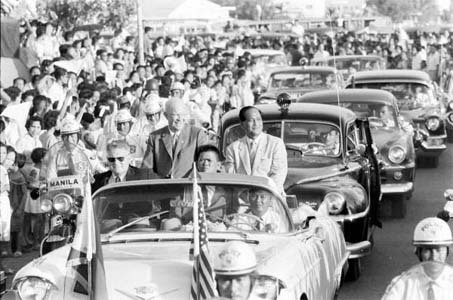 In the postwar days of pro-American sentiment, the whole country was primed for President Eisenhower’s visit in 1960. It seemed each theater presented a separate production company, for example: the Ideal showed MGM movies with movies such as “Mogambo” with Clark Gable and Ava Gardner, “Jailhouse Rock” with Elvis or Paul Newman in the “Fine Young Cannibals”. 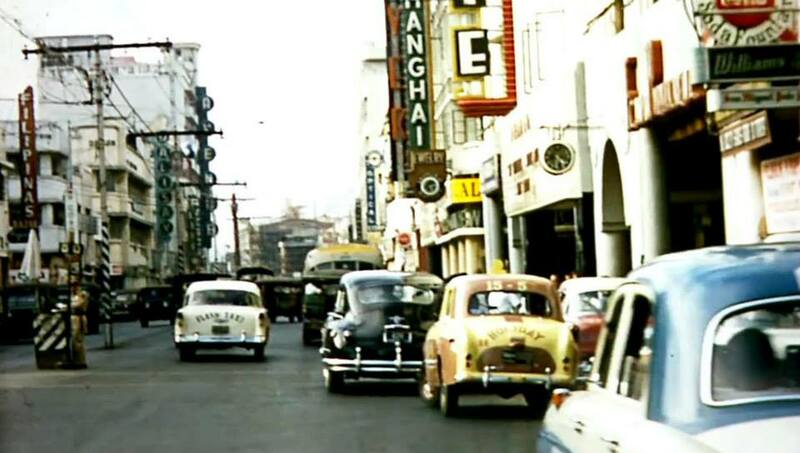 The Avenue featured Paramount Pictures where I enjoyed the Dean Martin-Jerry Lewis flicks. By night, the lights of Avenida Rizal would rival many streets of other cosmopolitan cities in the world. There were also streets running off each side of the avenue like esteros from the Pasig. The side streets such as Echague, Carriedo, Raon, and Azcarraga (C.Recto), to name just a few, all had a flavor of its own and would offer a specialized type of shopping. Echague (Carlos Palanca street) wound its way around the Pasig, past the impressive Great Eastern Hotel, the historic La Quinta market and on to General Solano to the San Miguel district and Malacañang Palace. Looking for cheap goods, from clothing and shoes to cookware ? 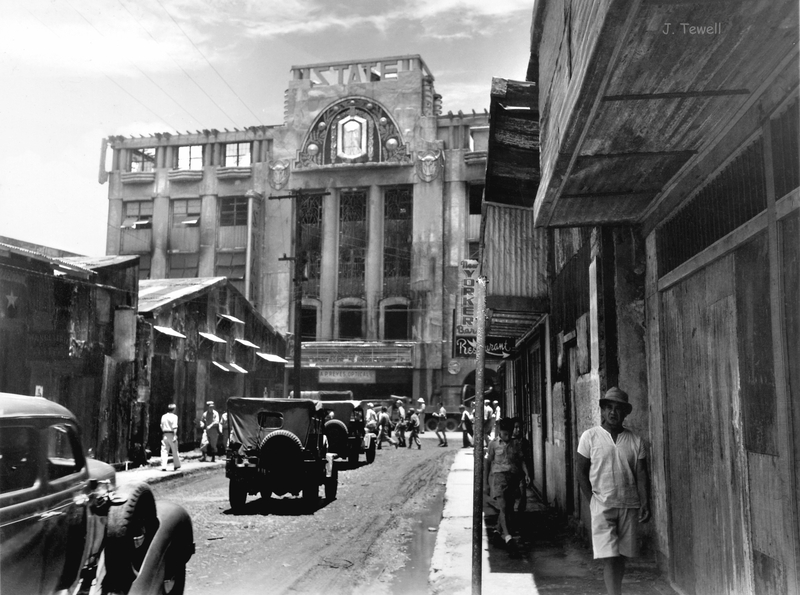 Just around the corner from Plaza Goiti started Carriedo, gateway to the Quiapo district. Compare these two photos from the 1890s to 1958. 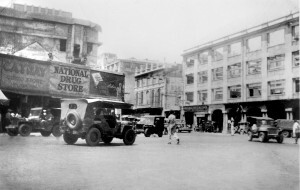 Continuing north, right across from the State Theater was Calle Bustos on the left. It wasn’t much of a street, almost a large alley and gateway onto Plaza Sta. Cruz and of course the famous and venerated Sta. Cruz church. 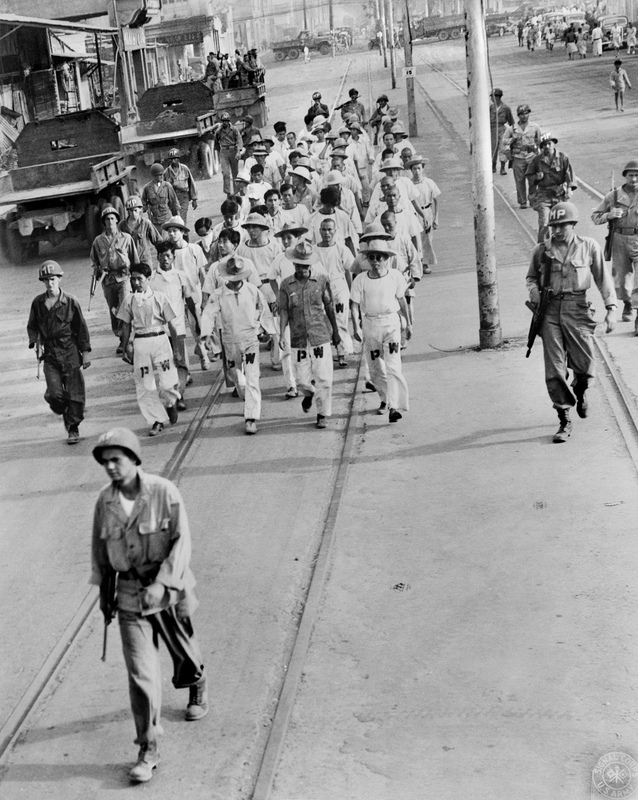 Calle Bustos is shown here right after liberation. Ah, Raon was fantastic for a budding musician like myself. 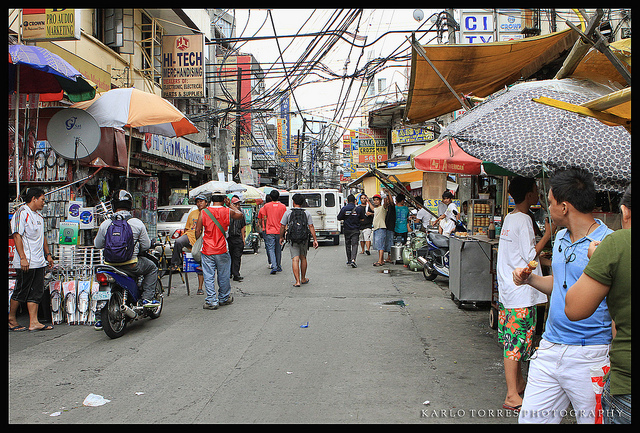 The street cuts through Rizal all the way to Quiapo. Dozens of music shops, many of which actually built their own local guitars or imported them from the States: Fenders and Gibson, which I could never afford. I bought my first electric guitar there. I started playing music at age 4 when my mom decided that I needed to study the violin. I played classical music until I was about 12 but my heart was into rock and roll. So, I quit the violin and took up the guitar. I’ll say that I’m glad I never relied on music to support myself – I would have been broke a long time ago. These days, it’s called Gonzalo Puyat and abounds with shops featuring electronics, sports supplies as well as music. 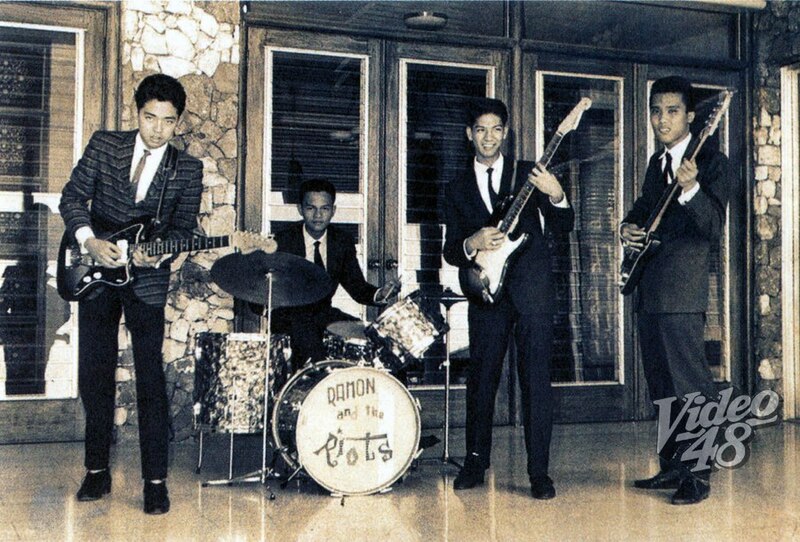 Interestingly, I’ve found that Ramon Jacinto (RJ and the Riots) who used to play on Bobby Ng’s Jam Session owns RJ Guitar, started in the 1980s, is one of the top guitar stores in Metro Manila. My band shared the Jam Session stage with him in 1961. Soler street, named for Sebastian Vidal y Soler, a Spanish botanist and explorer and director of Manila’s Botanical Garden. 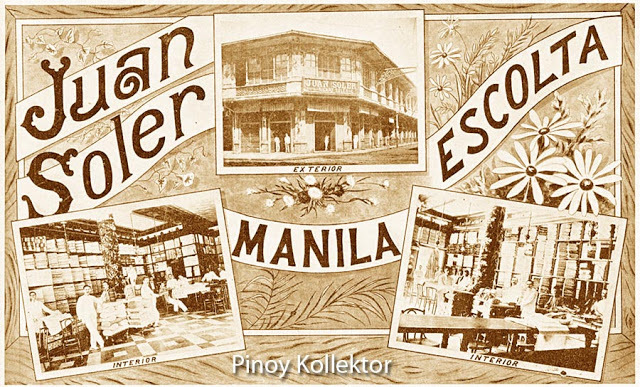 His son established Rickart Soler on the Escolta. 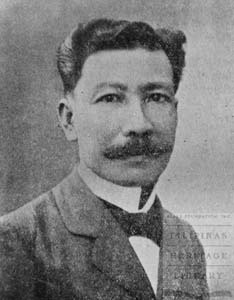 Also rich with history, Azcarraga (Recto Avenue) was named after the Spanish Prime Minister, Marcelo Azcarraga Palmero. 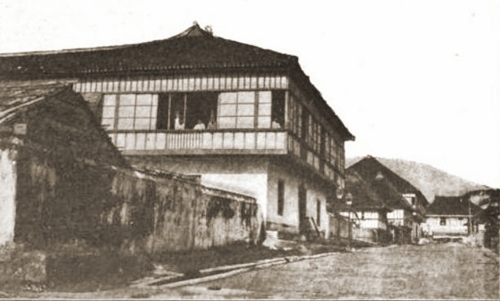 On July 7, 1892, the revolutionary society Katipunan was founded at 72 Calle Azcarraga. Residence of Deodato Arellano on Azcarraga (now Claro M. Recto Avenue), near Elcano Street, Tondo district, birthplace of the Katipunan. The famed publishing house, Carmello and Bauerman, located on 2057 Azcarraga, was founded in 1887 by a Filipino, Don Eulalio Carmelo y Lakandula, artist-engraver and William Bauermann, German lithographer and cartographer working with the Bureau of Forestry at the time. 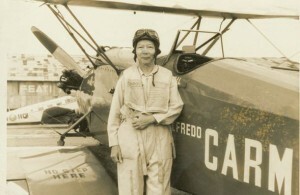 Don Eulalio was the father of Alfredo Carmelo, known as the dean of Filipino pilots, who continued to run the business presiding as president in 1938. A familiar landmark to all is the Capital Pepe building designed by Juan Nakpil and built by Doña Narcisa Buencamino vda. De Pepe de Leon. Shown here soon after liberation. Capitan Pepe died in 1934 after thirty years of marriage but Doña “Sisang”, armed with an acute sense of business, continued to acquire real estate. After her husband’s death, the government appointed her to the board of NARIC, the rice distribution agency. Her continued success allowed her to invest in many side businesses, among them a small film company called Del Monte Pictures. During the 1930s the Philippine film industry was in its infancy and Doña Sisang was not satisfied with her investment, so in 1938 at the age of 61, she decided to found her own movie production agency: LVN Pictures. Alas, the theaters are gone. The last I saw of the Avenue , it was an empty shell with vendors in the lobby. It was demolished in 2006. The Ideal was demolished in the 1970s, the Scala was closed in the 1990s, the State theater also closed in the 1990s and demolished in 2001- they are all gone. The Odeon is now a shopping arcade. The Ever theater is closed and now a commercial arcade. Manila’s politicians with seemingly no sense of urban planning, respect for environment and clearly deficient in taste, decided to add the LRT down Rizal Avenue. What was once a bright and sunny shopping area turned into gloom with the overhead trains. As if the ubiquitous jeepney was not enough to clog the streets, Manila citizens had to deal with the dark and dingy atmosphere under the LRT, many homeless living under the protective rails. 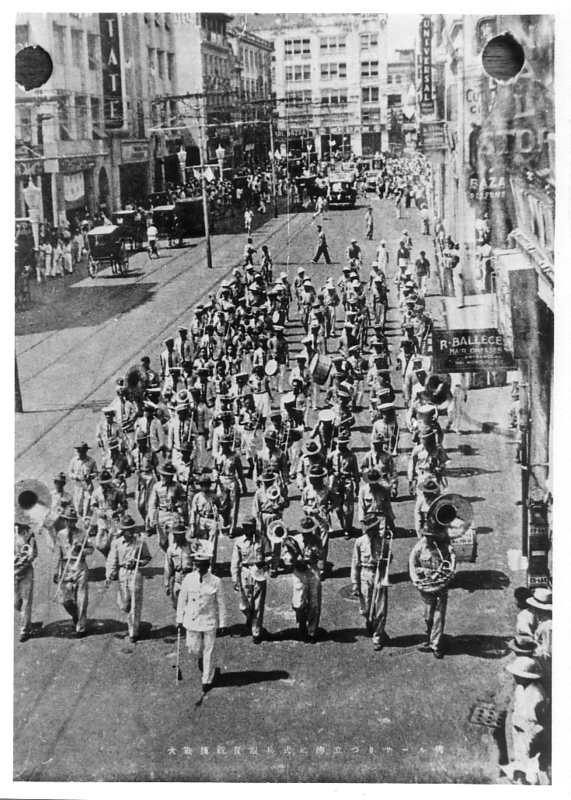 Carriedo was pedestrianized (I’m unsure if it is today). I believe the only structures that can withstand the might of the politicians are our churches, schools and shopping malls. So, I leave you with this thought. 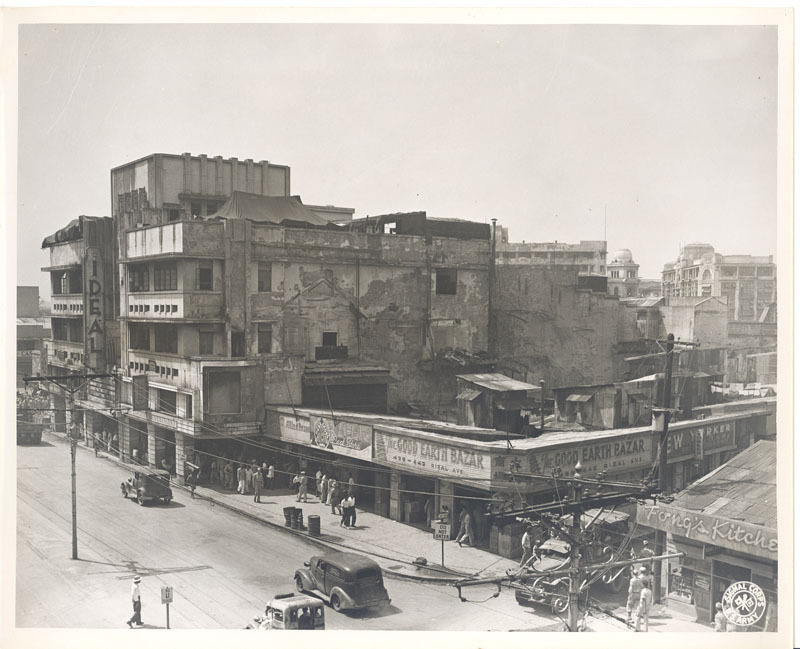 Which photo depicts a lively, commercial street. The first one taken in the mid-1960s or this one ? 42 Responses to Rizal Avenue – A street to love. You did it again, Lou. Congratulations my friend. Another great article Lou. 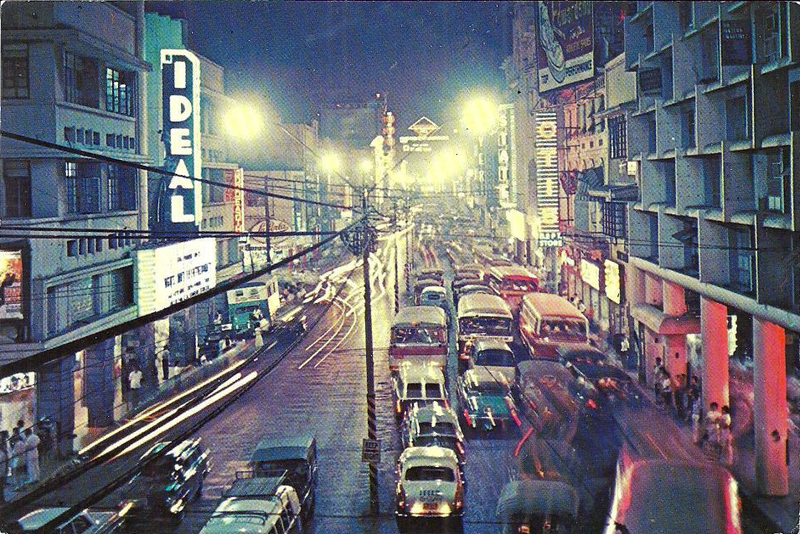 I remember going to Rizal Avenue in the mid and late 60’s to hit the movies, especially, Ideal and Odeon. Saw “How the West Was Won” at Cinerama, which was my first (and possibly Manila’s first) escalator. 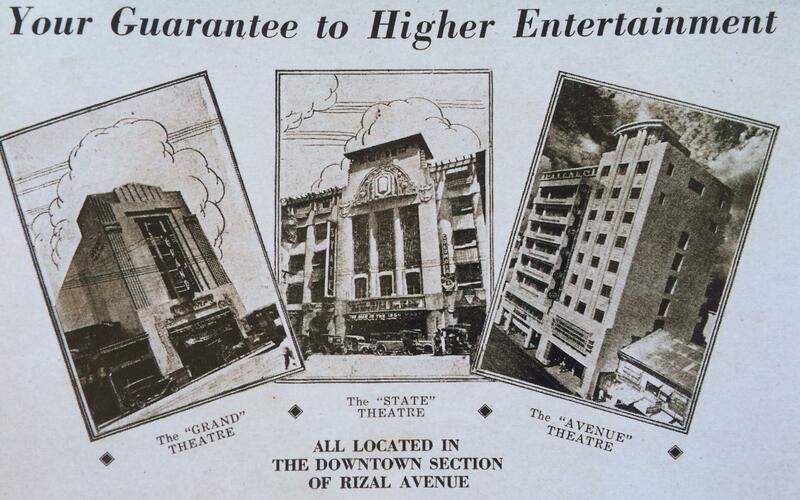 I liked those theaters better than Rizal theater because the screens were huge. Amazing work Lou. Your article helped me recall my trips to Samanillo building in Escolta where my father had his dental clinic to have my aching tooth fixed. From Blumentritt in San Juan where I lived as a boy, I’d take the G Liner and get off somewhere near Quiapo Church, walk all the way up Carriedo St, cross Avenida Rizal and on towards Plaza Sta. Cruz and into Escolta. After my dental treatment I’d go see a movie in one of those first class theaters, or go to a second run theater for two movies. What a treat! On the way back, while waiting for the G Liner at Echague, I’d buy a bag or two of hot hopia to bring home. Those were fantastic days. A nostalgic pause…As always, thank you, Lou. Great photo of you and your guitar in San Lorenzo. Another feather in your cap, Lou!!! Makes one feel Nostalgic for yesterday’s shopping daze! Congrats again! good work Lou, learning so much about our past. Keep it up! That was a visit down memory lane. 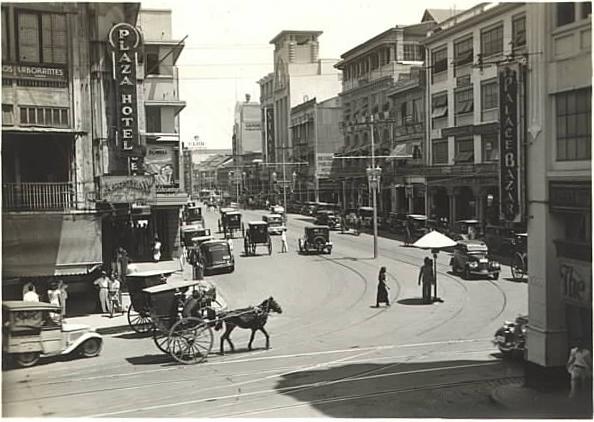 I grew up near San Lazaro Hippodrome on M. Natividad Street right next to Avenida Rizal. There used to be four second run movie theaters in the neighborhood along Rizal Avenue; Alegria and Lotus by Tayuman, Cine Noli and Cine Manila between Laguna and Batangas Streets. Alegria and Noli show Tagalog movies while Lotus and Manila show American films. Hey your mom is a real sharp cutie (as we would say “in the olden days”). But then that photo of little Lou, the aspiring musician, was really cute too! Everytime i’ll take vacation in the Phil.I did not forget to visit,Raon to eat Lumpia at Globe lumpia house,Rizal Ave.,Carriedo,and especialy Recto which remind me during my college days in the 80’s. Reading through your article brought back good memories of Rizal Avenue/Avenida. 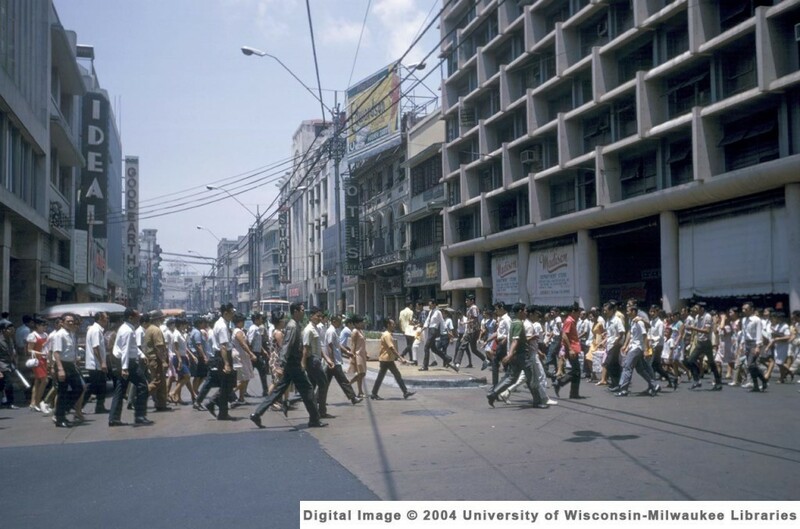 As a go-to place for school supplies, trolley school bags, black leather shoes, white polo for school uniforms and undershirts (Crab brand) during elementary years in the early 70’s, I’ve come to know Avenida by its other name: Downtown. My schoolteacher aunt would bring me to Downtown, for a treat of hamburger sandwich bought at Pacifican Restaurant (beside PhilSavings Bank building) along Hidalgo, after saying a little prayer in Quiapo Church. Turning right from Carriedo, we head off the long stretch of Avenida shopping along the different department stores: Good Earth Emporium, Otis Dept Store, Josenia’s, and eventually ending up at the multi-floored National Book Store to buy the latest titles of LadyBird book series or the books I need for school. One more thing: it was in Avenida where I first saw LIVE human mannequins inside big “escaparates”. Young as I was then, I already know how difficult it was for these models to remain catatonic and being ogled at by shoppers. Thanks, Sir Lou, for another interesting and informative article. 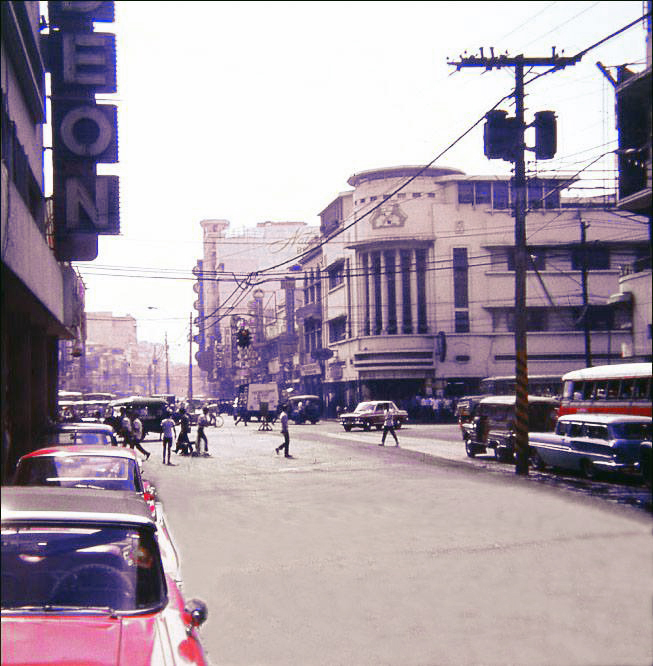 I have not had a chance to go back to Avenida Rizal and Raon since the mid-60’s so I really enjoyed reading your anecdotes and reminiscing the days I used to shop for electronic parts and 45 RPM’s in Raon. I seem to recall that Azcarraga was also known for second-hand school books — stores would buy books from students who needed money. As always, thanks for the awesome memories Lou! Take me back in your arms Manila,And promise me you’ll never let go,Promise me you’ll never let go Manila. Hello Mr. Gopal. 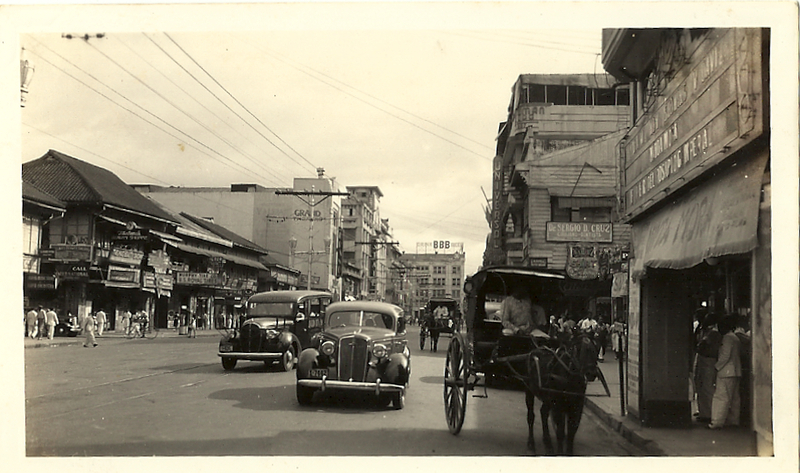 Thank you for taking the time to post these pictures of Old Manila. 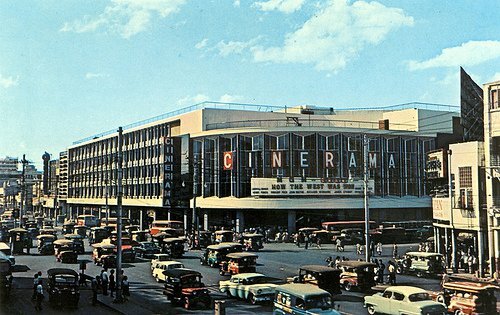 I grew up in Manila and remember walking down the streets of Avenida Rizal and watching movies at the Cinerama and State Theater. Your article brings back a lot of memories I want to remember and pass on to my children. 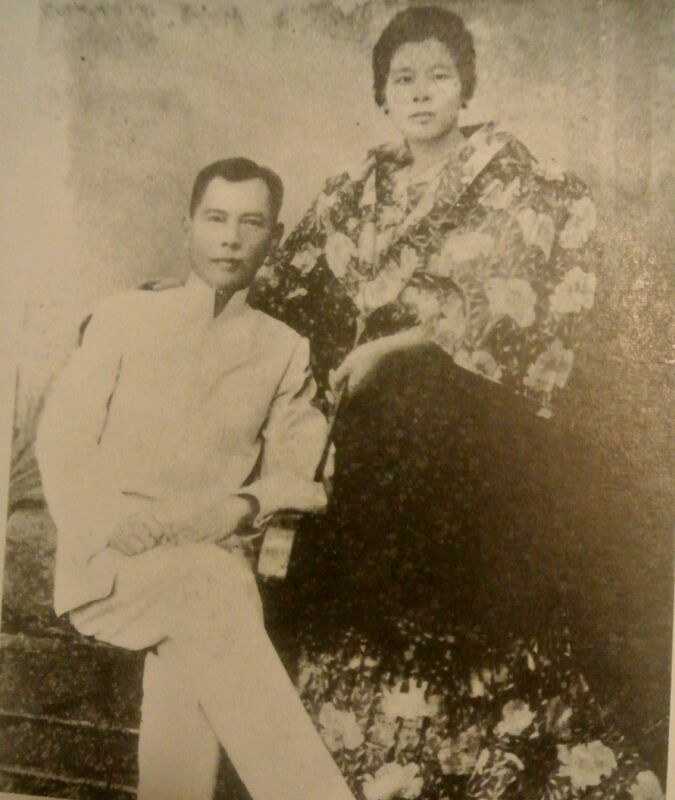 The war was a story often told by my parents who both suffered greatly during the Japanese occupation. Reading about it in your blog as well as looking at all your pictures brings back memories of war stories as told by my parents. When I look at your pictures of Old Manila, I try to imagine my parents walking along those streets before the war broke out. Looking forward to your future posts! 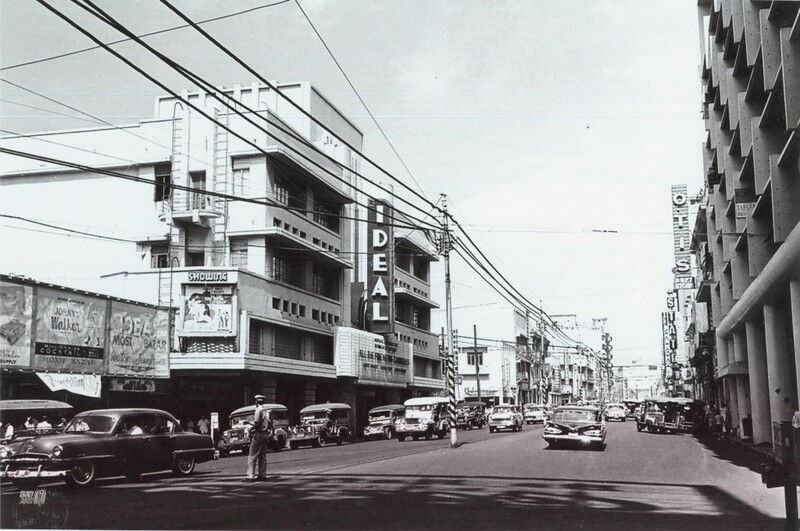 Viewing your pictures of Rizal Avenue from the corner of Hidalgo is like being an eyewitness to history. 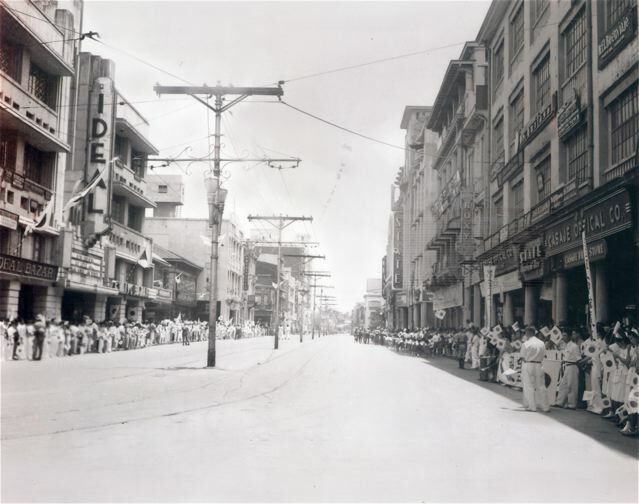 From the early scenes of pre-war Manila to the parades of Imperial Japanese occupying forces, followed by glimpses of American units streetfighting along the Avenida, this historical street corner could tell us many things about events that have shaped Manila, if it could only speak. Through this pictorial panorama I was intrigued by the art deco structure of the Ideal Theater, one of our city’s great landmarks that survived the war. 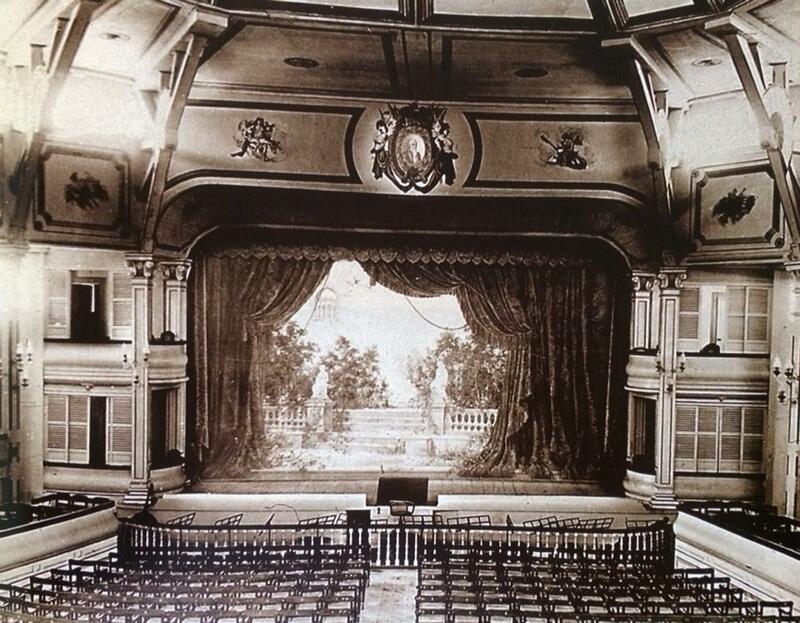 The Ideal Theater was designed by National Artist in Architecture Pablo Antonio, and owned by Rafael Filomena Roces Sr. of the distinguished Roces family. True to its design as a unique building, the cinema stubbornly retained its uniquely mispronounced name throughout its history. It was called “Eedeeal Theater” by everyone who ignored the correct pronunciation but vastly enjoyed its offerings. 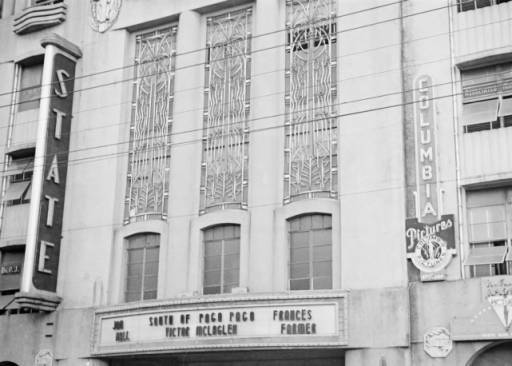 The Ideal Theater was signed up exclusively by MGM distributors and exhibited what have become film classics like The Wizard of Oz, Singing in the Rain, and An American in Paris. What is unknown by many is that during the war, the Ideal Theater building became a meeting place for the underground movement against the Japanese invaders. 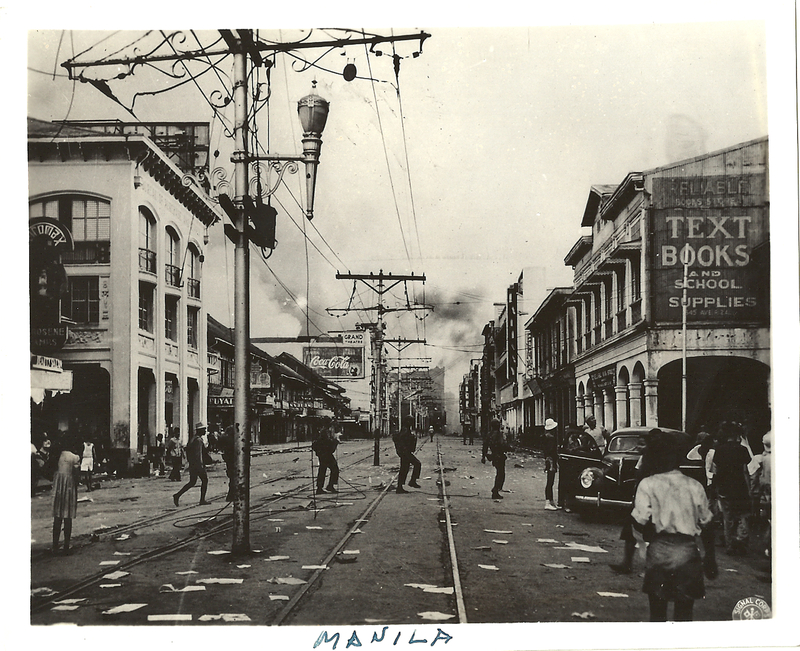 It was here that Rafael “Liling” Roces, a journalist and founder of the Free Philippines guerrilla group, met colleagues and distributed anti-Japanese leaflets in occupied Manila. Liling Roces was a gifted writer and hero. He wrote the editorials for the Free Philippines, one of them so inspiring that it was smuggled to Corregidor and read over the Voice of Freedom radio station. Unfortunately, he and members of his group were caught by the Japanese, imprisoned in Fort Santiago and tortured. On the night of August 29, 1944, Liling and 27 others were transported to the Chinese Cemetery in La Loma by the Kempetai secret police and made to dig their common grave. After midnight, all were beheaded. The United States Medal of Freedom is the highest honor that America can bestow on a civilian for exceptional deeds of valor. It is subtitled, “The Bravest of the Brave.” A monument to Rafael R. Roces and the 27 slain others was erected on the site, but today it is ignored and forgotten, just like the memory of the heroes it commemorates. After all, they are yesterday’s heroes. Bravo Larry ! Thank you for that history of the Ideal Theater. I was fortunate to meet and talk to Marcos Roces back in 2004 while we were in Manila doing research for our film. There also was Ever movie house. I would watch dracula and other suspense films there. Funny, I would warch on my own buying a bag of popcorn and watch Michelle Dotrice in suspense films. I watched the series of movies of the Man from Uncle at Ideal, James Bond 007 at Odeon , Ever – The Longest Day. Ahhh, How the west was won at Cinerama. Keep it up Lou. Thanks. Your article was passed on to me by a good friend, and I just want to THANK YOU for a GREAT and AWESOME Article about our beloved city. I was born and raised in Manila, like your other followers, have enjoyed the days and life then. I now have the pictures my parents were describing during their time. 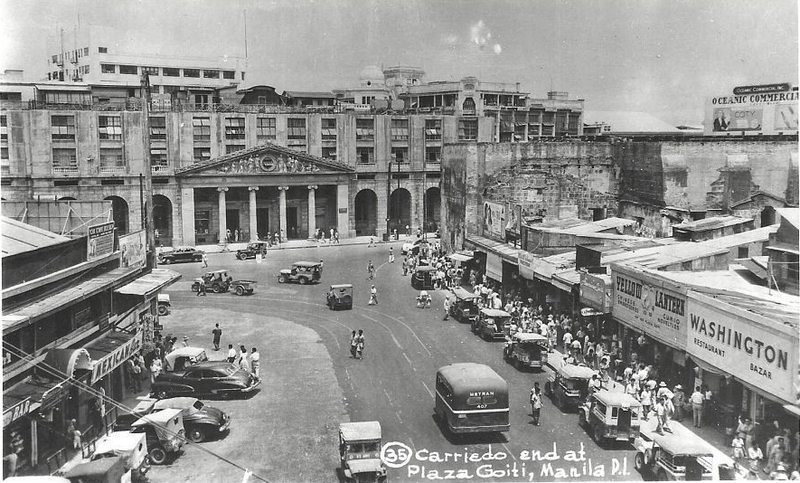 I remember Rizal Avenue and Escolta and the connection to Divisoria (which I think WAS so sad). But we have our own pictures of life. I know that the LRT made the Rizal Avenue, Carriedo, Escolta, Recto Avenue and other streets became more of a forgotten view, and I miss it. Though the LRT is a sign of the modernization, there is the trade off of the past which some of us love, and life must go on. and smell the not so good smell during the rainy season, but that’s what it was, and I am very proud to be a part of it before. I also remember how to cross the street when the flood waters were there. It was the time then, but I am sure everything is way much better now. I was reading your article and I can’t help but have some tears in my eyes….those were the days I was walking with my parents and enjoying the scenery and beauty of our country’s past. Thanks again for a very awesome article and pictures. Keep the good works going. Hi Leo, many,many thanks for the “trip down memory lane”!! 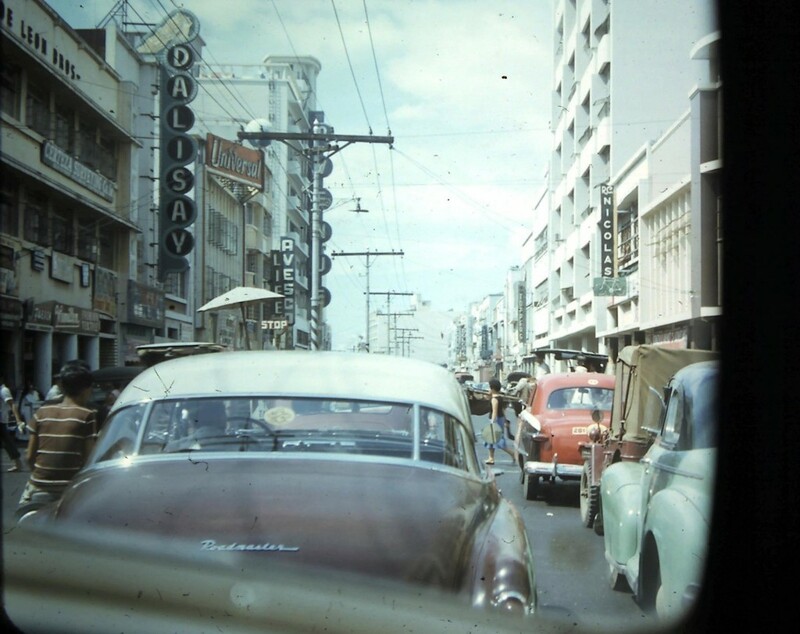 You know i really don’t remember Rizal Avenue or avenida Rizal,as it’s called,so your your pictures of the good old days were great!! It’s a wonder that you still have so many of them. I remember when we got back from the states,seeing Ideal theater was a surprise and of course,i mispronounced it and my Lolo had to correct me! Wonderful! Splendiferous! What can i tell you? Many thanks indeed for your great work. Keep ’em coming! Amazing Sir! I’m so speechless especially those old photos during the Spanish and American time. Salute! Thanks for sharing! Hi would you remember the tailor there who made your uniform? 🙂 Is he still there? Hi! I lived most of my life along Batangas Street. My grandmother in her mighty age of 99 was born & still lives there. Going through this article with photos gives me a glimpse of what it was like for her back then. Thank you. 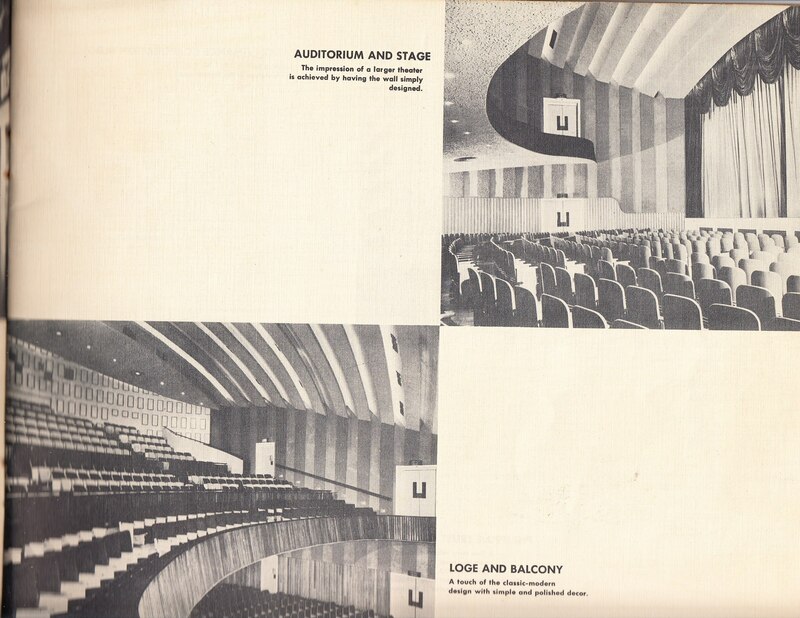 I’d like to ask if anyone here might have any photos of Cine Manila that you wouldn’t mind sharing with me. Thank you for taking me back to the time that i wasn’t able to experience. Even if i was born in the late 80’s I always dream of traveling to the years that was defined as the time when Manila can still compete to the other world renowned cities boasting it’s extravagant buildings, world-class architectures and the responsible/respectful citizens. Not saying that people are irresponsible/disrespectful now but with the way that those supposed to be landmarks are being treated, i think that those “piping saksi sa kasaysayan” heritage that we have deserve more respect than what they are receiving. I’m 17 years old and I’m really fascinated and interested of what these places are before especially rizal avenue and escolta. I dreamed of being there to that place in the past . I haven’t been to this places before . 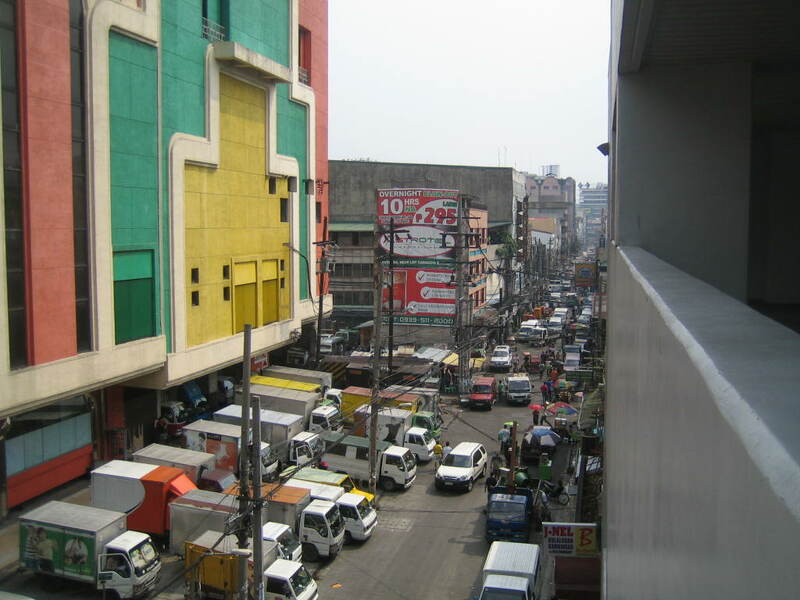 And as for the Rizal Avenue , what is the current state of the place are there any improvements so far ? . Reminds me of Orchard Road in Singapore . 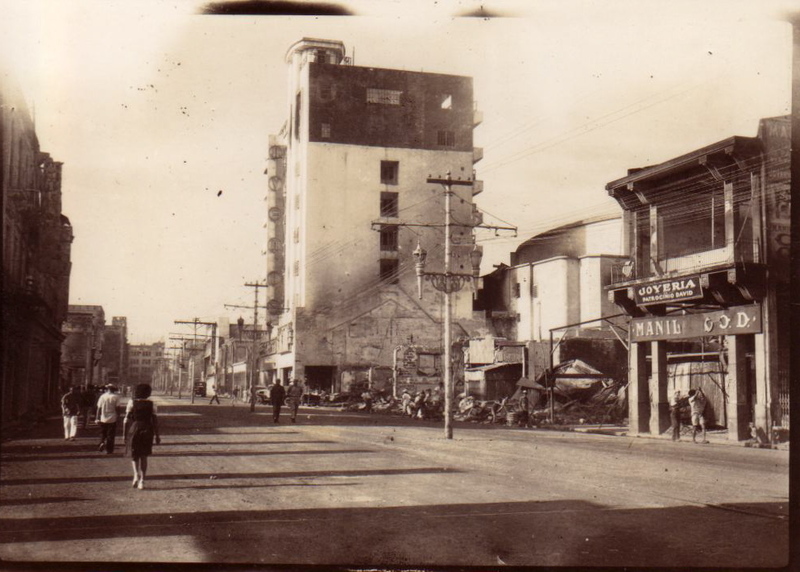 does anyone have any information, photos on Sampaguita Hotel on Rizal Av – Carriedo ? Closed in the 70s. Owned by the Pijuans. 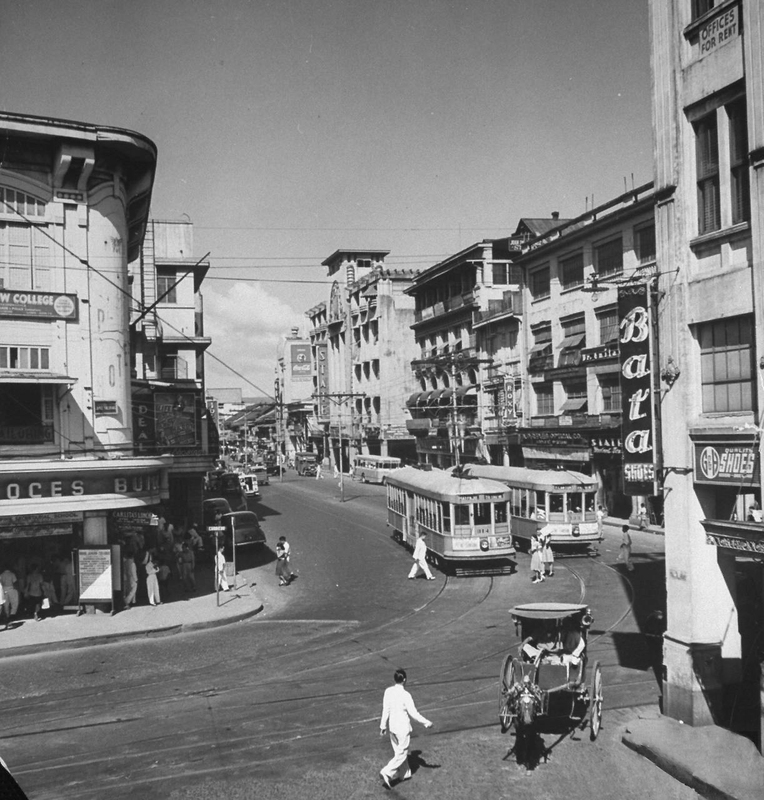 Thank you for posting these rare photos of old Manila. 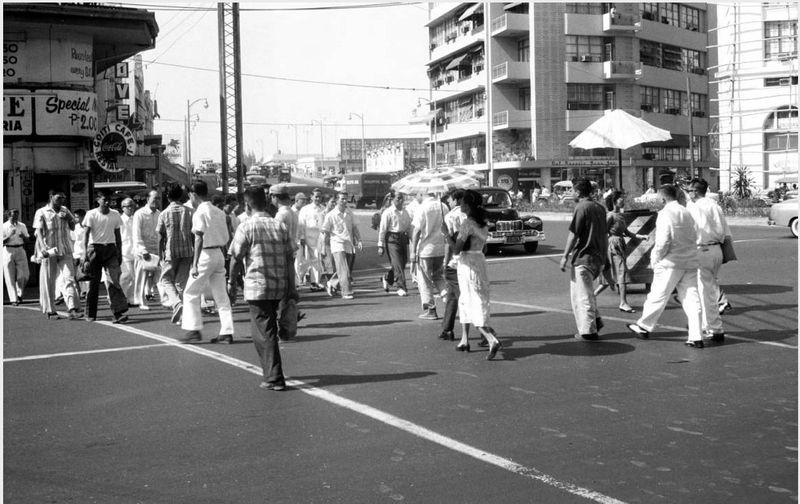 I was a young boy in the 1970s and I remember parts of Avenida before the “uglification” started with the LRT in the early 1980s. Galaxy Theater was among my family’s favorite weekend treats. Good Earth Emporium was an occasional escape with all those arcade machines at the top-most floor. I was truly aghast at the sight of many homeless people who now live in utter squalor just under the LRT stations all over Avenida. The local government will most likely not clean up this portion of Manila because the delegates of APEC 2015 won’t be touring this ugly side of Manila anyway. Elsewhere, the homeless people along Roxas Boulevard have all been rounded up and now “hidden” somewhere, probably released after the APEC 2015 Summit. The last time they hid the homeless people of Manila was during the brief visit of the Pope in early 2015. I wish I could hug you. Twice. Once for reminding me of our annual XMas vacations in the mid-’50s my dad and I spent with my elder sister (both departed), and twice for making me tear up with a ton of good memories. Thank you for sharing these images and your walk through the decades. 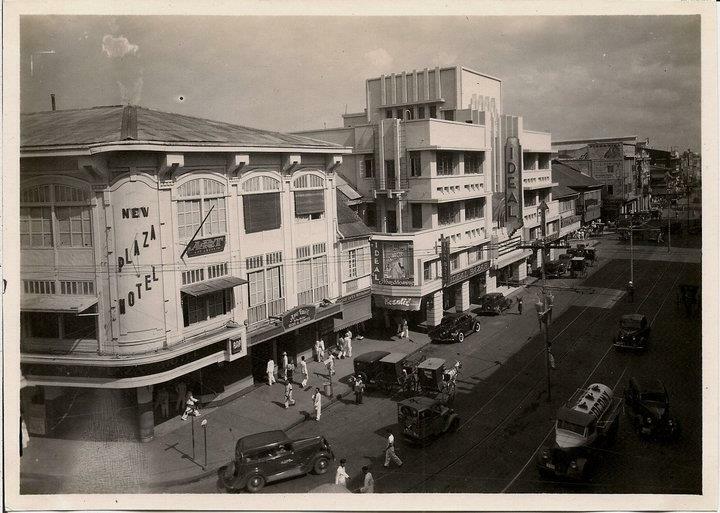 Great collection of Avenida Rizal in the 30’s thru the 60’s, most of these pictures only exists in my mind since back then when I was growing up I have no access to a camera.Fond memories of all the theaters lining the Avenue all the way to Scala showing 2nd run flicks. I remember standing room only on the showing of The Great Escape with Steve MacQeen on the motorcycle (famous jumping scene). We didn’t know at that time that he was actually chasing himself on those scenes! Hollywood trick but we liked them. Also remembered very fondly was Alemar’s bookstore where you can lose yourself perusing all the “pocketbooks” as we say it back then! Can afford to buy only one or two of those things as money was extremely budgeted. Thanks for the memories hope you can publish some more. 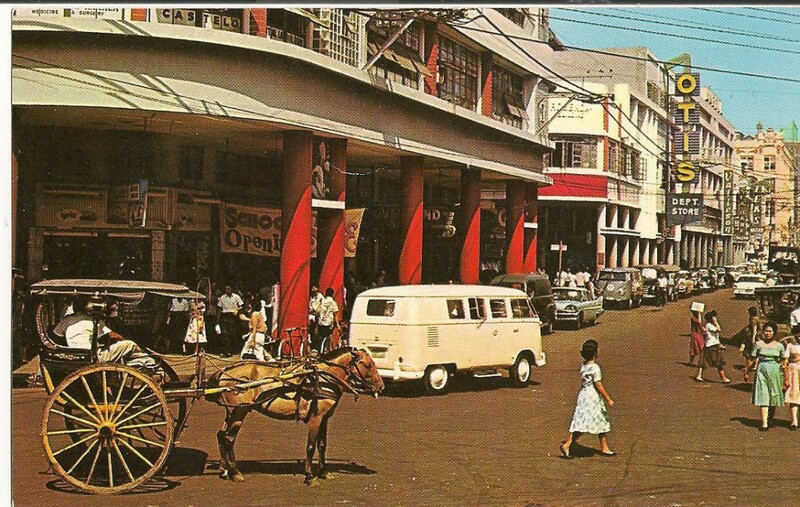 How sad it is to think that generations nowadays were not able to experience the glorious days of Manila way back then. As for now, Avenida is like a doomed place, wherein there are a lot of rugby boys, prostitutes, snatchers etc.. 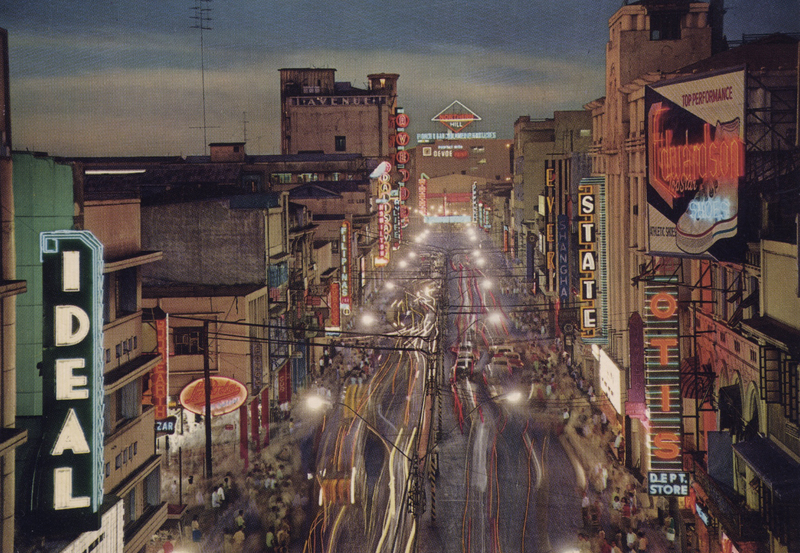 I wish the government could bring back the glamour of Manila in the future. Thanks for your blog Sir! Such a wonderful work. Good job! 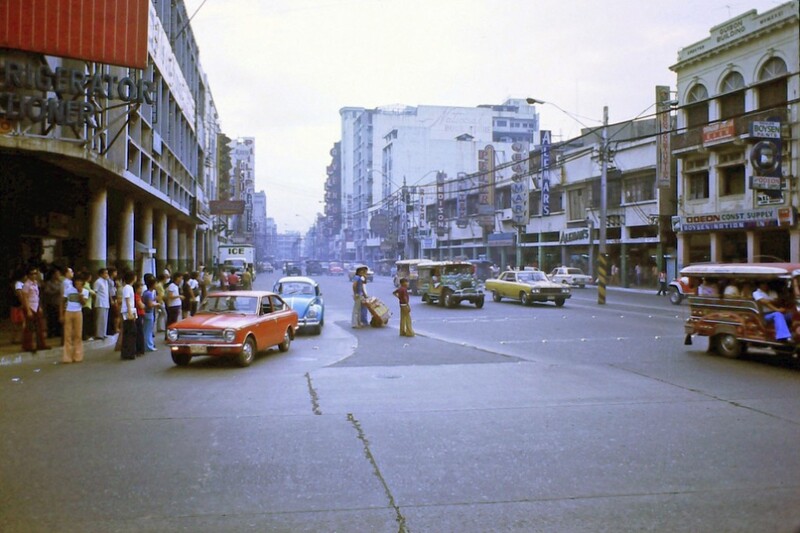 So this is how the Avenida of old looks like. A mighty powerful and influential street, I should say. I was born along Oroquieta between Alvarez and Quiricada. Even if I no longer live there, it really excites me to see, read, and know tidbits of history of Sta. Cruz and Manila as a whole. I guess I’m a Manileno in mind and spirit. My heart never left the place (I still vote and pay my professional tax there just to get a good excuse to visit). Thanks, Lou, for this! Keep on sharing your photos and insights! I was born and raised in Manila. We used to live in an apartment at an alley along Rizal Avenue. I have so many good memories of the years spent there as a child. Seeing the pictures and reading your article brought me back there. Thank you. Your photo essays are all wrought with nostalgia and are just as lovingly writ. One could tell that the writer has a terrible longing for the good old days. Thank you for this website. I am an 80’s kid but I am proud to say that I saw most of the old building mentioned here, albeit in their decrepit states. You mentioned the Barrettos as being the owners of the Hotel de Francia on the Escolta. Would you more about them? When did the Hotel de Francia close? The places, they all bring back memories, both happy & exciting. I attended MIT high & college, from 1968 to 1979 & those places mentioned were places I had been & frequented. The jeepney fare back then was 10 centavos & having not enough money, madalas akong magtres, much to my chagrin if I get caught hahaha. I usually take the jeep from Balintawak to Intramuros when I visit, passing by the places & landmarks mentioned, the same route I took growing up. We’ll be back January & for sure, I’ll be traversing the same streets to reminisce but I’ll be stopping by & spend some time in places like Bambang where Boy Alim & Off-Limited of the Levi’s knock-off fame, Doroteo Jose where Mapua once was located, Recto, Good Earth Emporium, Escolta, City Hall, the former Jai Alai venue, Luneta & the whole Intramuros. 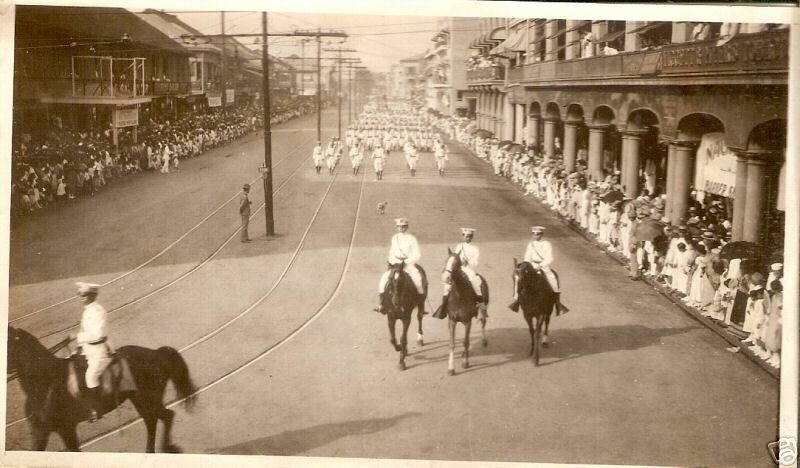 As a history teacher, I know that the Filipinos of the present generation will, through these pictures, be proud to see how progressive the Philippines was before WWII. Thank you for posting them. We owe a lot from you. More pictures please.